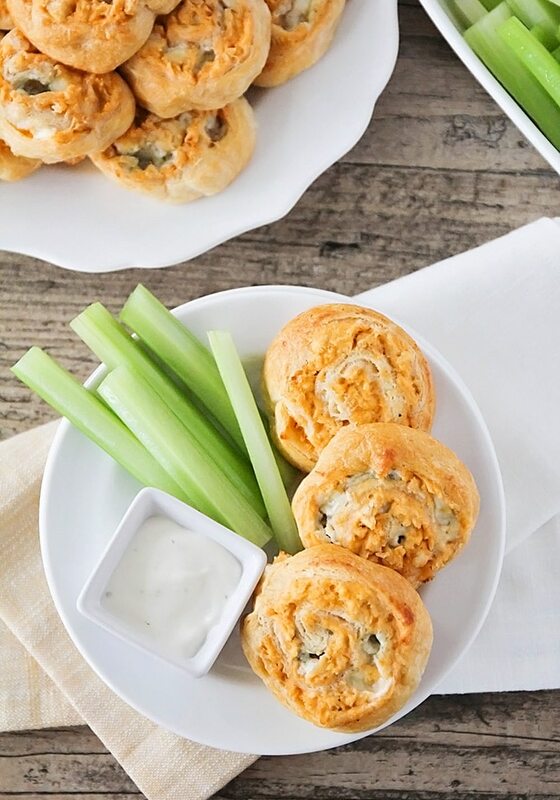 These savory and delicious buffalo chicken pinwheels are simple and easy to make, and perfect for game day or entertaining with friends! 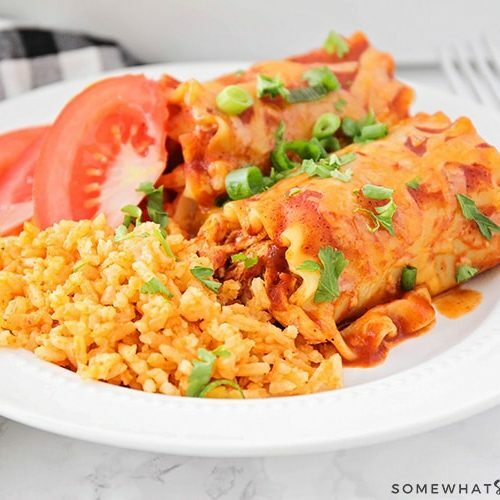 Are there any foods that you hated as a kid but now can’t get enough of as an adult? For me, blue cheese is definitely one of those foods. As a child, I would gag over blue cheese dressing, and heaven forbid someone sprinkle some on my salad. A few years ago, though, a switch was flipped, and now I can’t get enough of it! 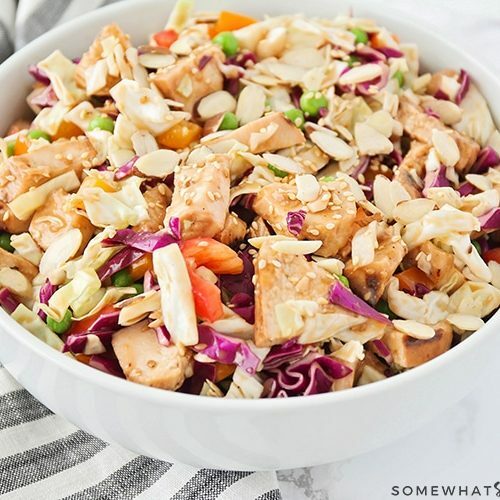 My favorite way to eat it is in combination with buffalo chicken, in any form. I’ve tried that delicious combination in a variety of forms, from buffalo chicken tacos, to buffalo chicken pizza. 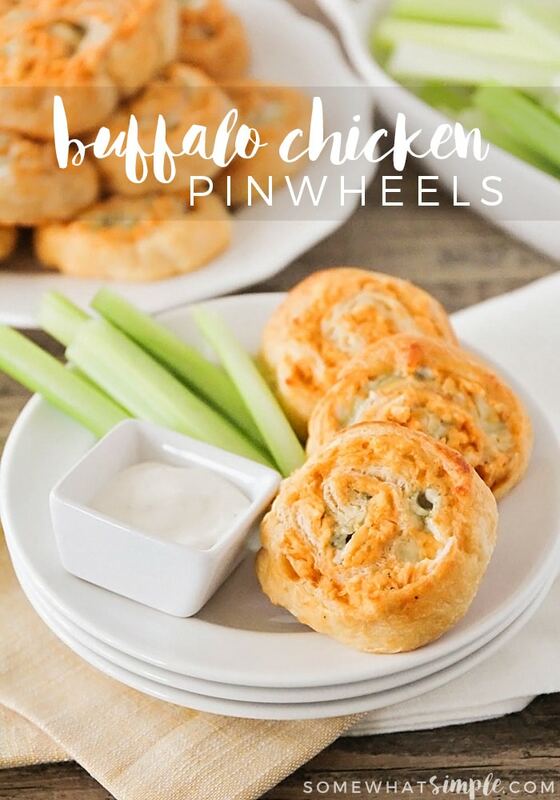 These buffalo chicken pinwheels are my newest variation on that theme, and they are fantastic! 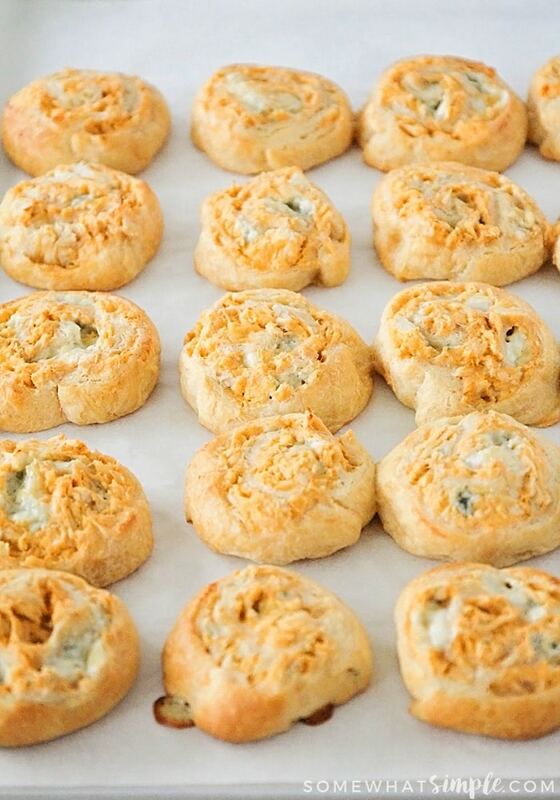 Creamy, cheesy, spicy buffalo chicken dip, all rolled up in a soft crescent roll dough and baked to perfection. They’re perfect for a game day party, entertaining with friends, or any time you need something fantastically delicious to eat. 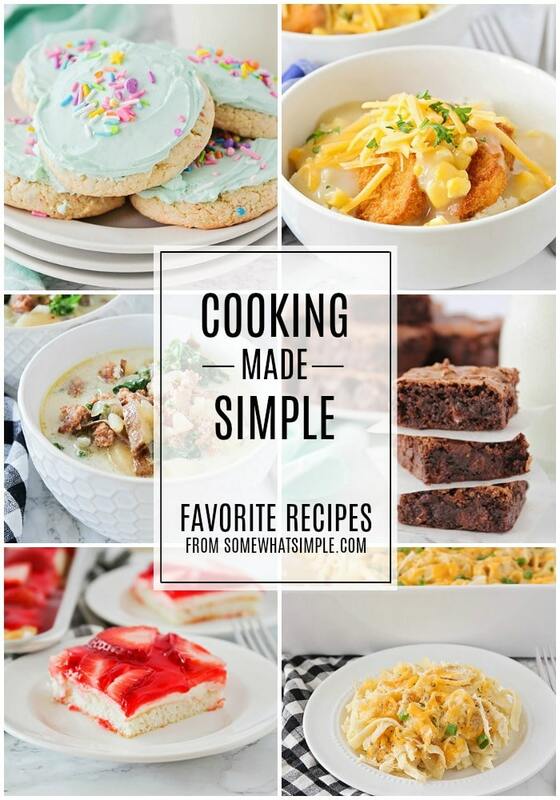 They’re simple and quick to make, and so easy, too! 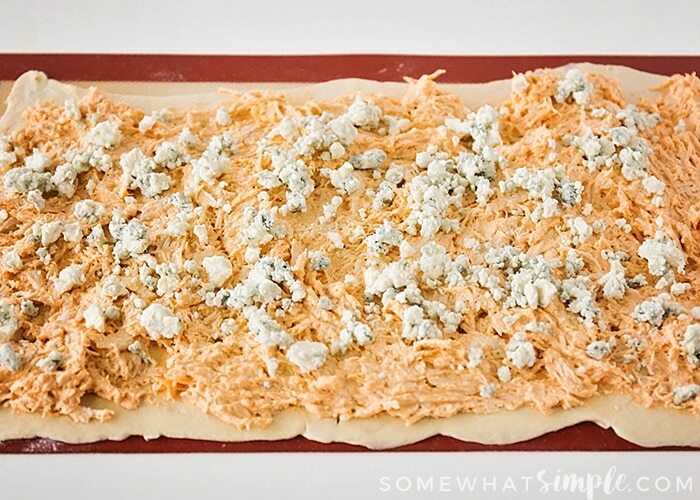 Start by rolling crescent roll dough out into a long rectangle, then spreading it with a delicious mixture of shredded chicken, cream cheese, and buffalo sauce. Next, sprinkle a layer of gorgonzola over the top. Roll the dough up into a long tube, then slice into 3/4 inch slices. Bake 18-20 minutes, until the pinwheels are golden brown and the cheese is melted. 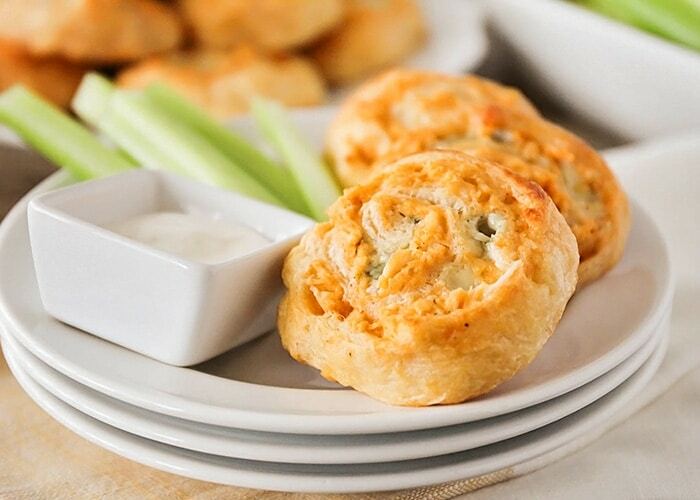 These buffalo chicken pinwheels are delicious with a side of celery and some blue cheese dressing for dipping. 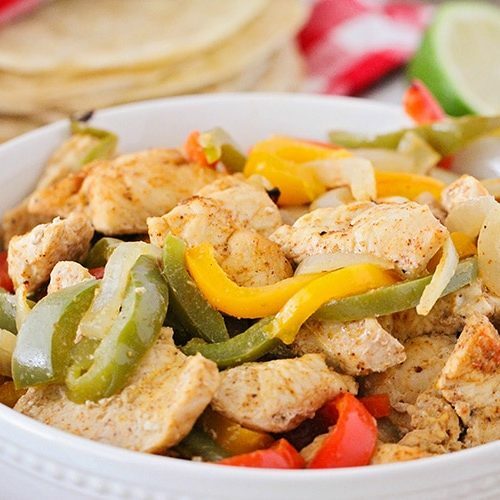 They will definitely be the star of your game day party! Preheat the oven to 375. Line a baking sheet with a silicone layer or spray with cooking spray. Roll the crescent roll dough out into a long rectangle, pinching together the seams as much as possible. In a medium bowl, mix together the chicken, cream cheese, and buffalo sauce, until combined. 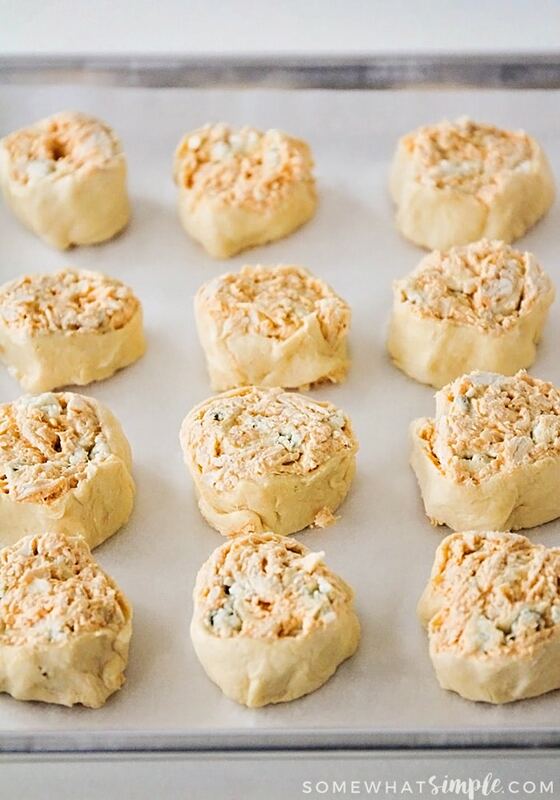 Spread the chicken mixture over the crescent roll dough, leaving a half inch around the edges uncovered. Sprinkle with gorgonzola cheese. Roll the dough up, starting at the long end, to form a long tube. Slice the tube into 3/4 inch slices, and place on prepared baking sheet. Bake 18-20 minutes, or until golden brown and melty. Let cool slightly before serving.